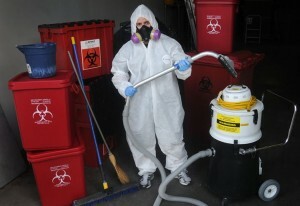 Disaster Restoration provides hazmat cleanup services throughout the Dallas, Texas metro area. Hazardous material may include biological fluids including blood and bodily fluids, and chemical spills. Disaster Restoration works closely with local police, fire department and EMT first responders to ensure that hazardous situations are cleaned up safely and sanitized. Hazmat cleanup services, including chemicals left behind from a bio spill, can have a negative impact on a home or business. Our Hazmat waste cleanup crew are trained and licensed in hazardous material control & removal. Our professional and licensed hazmat cleanup experts use the most up to date technology and Personal Protective Equipment to ensure top safety during a cleaning. If you live or work in the Dallas, Texas metro area and need hazmat cleanup services, call now for immediate assistance.